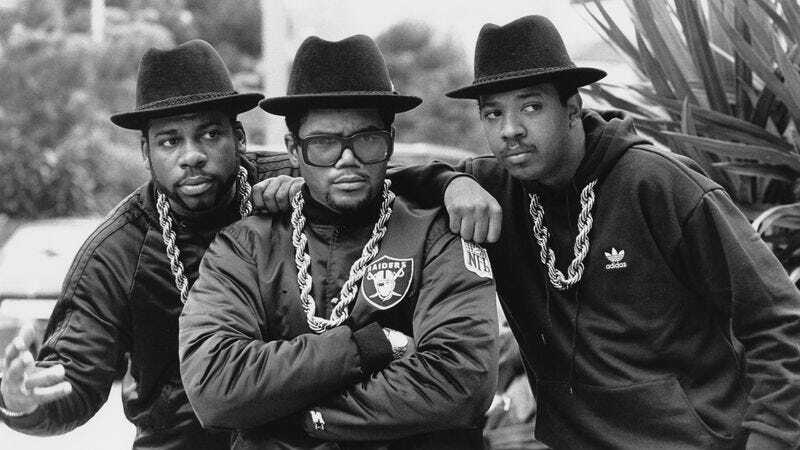 By 1987, Run-DMC was the most successful rap act that had ever been, having broken sales records that previously seemed unthinkable for the genre with its 1986 blockbuster Raising Hell. The trio was all too aware, however, that in hip-hop, success breeds suspicion. Now that the three had become rap’s first true stars, they were under more pressure than ever to prove that rap wasn’t merely a fad—and to do so without sacrificing the street credibility that so many of the genre’s other crossover acts had readily forfeited. The last thing Rev. Run, DMC, and Jam Master Jay were interested in, then, was recording an upbeat Christmas song that might undercut a carefully cultivated image as leather-cloaked rebels. Despite their initial skepticism, “Christmas In Hollis,” their contribution to the all-star 1987 charity album A Very Special Christmas (more on this a little later in the week), became one of the trio’s most enduring hits and rap’s first holiday standard, ubiquitous on TV Christmas episodes and commercials. Darryl “DMC” McDaniels spoke with The A.V. Club about how his group warmed to the idea of a Christmas song, and why the funky ode to holiday comforts continues to resonate 25 years after its release. The A.V. Club: Where did the idea for “Christmas In Hollis” come from? DMC: Yup! That’s it. You know the funny thing? I never heard the actual record until five or six years later. So Bill gives Jay the song to take to the studio and put the record together. Me and Run, we hadn’t heard the music yet, but Bill keeps trying to convince us to do it. Meanwhile, Jay took the record to the studio, chopped it up and put the music together, and as soon as Run and I heard his beat, we were both like, “Yo, this is dope!” So Run went home to write his rhyme, I ran home to write my rhyme, and we went to the studio and laid it down. But we had no idea that record was going to become an official, historical classic. We thought it would be a novelty for a year, then after that people would forget about it. For us, it was fun to record, because of the way Jay played the beat so hip-hop, so we were really happy with it, and then I guess it came out so good they wanted to do a video for it. And once again, they got that reluctance from us. “The video can’t be corny! You can’t clown us!” We gotta give the credit to Bill Adler for even thinking of using that song, because it could have went totally wrong. We wouldn’t have done it if the beat hadn’t been that funky. AVC: Had there been a notable Christmas rap song before “Christmas In Hollis”? That was huge! Me and Run were always like, “Yo, Kurtis Blow’s ‘Christmas Rappin’’ is the only Christmas rap song that should be in existence!” Because that was dope. It was, like, [Impersonates Kurtis Blow.] “Don’t you give me all that jive about things you wrote before I’s alive / Because this ain’t 1823, it ain’t even 1970 / Now I’m Kurtis Blow, and Christmas is one thing I know.” Classic! Classic rap record, talking about Santa Claus! That record was incredible. So me and Run, we were like, “Well, if we ain’t gonna beat that, there’s no sense in even doing it.” So technically, “Christmas Rappin’” is number one, “Christmas In Hollis” is number two. But “Christmas In Hollis” has just become such a standard. It’s like Nat King Cole, Bing Crosby, and Run-DMC now, you know? AVC: What is it about the song that you think allowed it to hold up over the years? But for real, just this last year, I’m sitting here, and a Toyota commercial comes on, and it’s a white lady and her friends in a car coming from shopping. They turn on “Christmas In Hollis,” and these women are reciting my lines. You know the reason why I hate the holidays? When I go to the mall during Christmastime, everywhere I go, people scream those lyrics at me. I was on the highway, stopped at traffic, and somebody was like, “Yo, roll your window down!” So I roll mine down, they roll theirs down, and my verse is playing. AVC: The timing of the song was interesting. You recorded it after Raising Hell, but Jay’s scratching and sampling anticipates a lot of the techniques you’d use on your next album, Tougher Than Leather. DMC: Definitely. It’s very interesting. See, we were on a roll with that Raising Hell album. We were on a roll! “My Adidas,” “Peter Piper,” “Walk This Way,” “Raising Hell.” That whole album, we were operating at such a high level of creativity that “Christmas In Hollis” had to turn out dope, or else it never would have hit the turntable. We were just in that zone. We could have recorded a song for Disney that would have changed the whole history of Walt Disney. It was just what we said about Jay: Everything he touched turned to gold. It was crazy. AVC: What was the video shoot like? DMC: We had to leave our tour and come into New York for one day to shoot the video, so the video shoot was tiring, and we were mad, but it was fun. Even though the video turned out cool, some of the stuff I look back at it, and… Well, I guess that’s just the way videos were back then. There’s a lot of stuff in the video where we were so tired that I think… The pit bull dressed up as the reindeer? That was kind of cool. They knew we didn’t want to do anything corny, so I think all the elements that could have been corny, they got creative in order to keep me, Run, and Jay happy, so we wouldn’t walk off the set. And that was really my mother in that scene. That lady that’s in the scene before the food is really the lady that cooked all the chicken and collard greens. And she chased the little elf at the end of the video—that was my mother, Bannah—the real lady who cooked the collard greens, chicken, and macaroni and cheese. AVC: Was she honored to be in the video? DMC: She was. That was like a celebration and a tribute to her. Listen, when I was a kid, Christmas, New Year’s, birthday parties, Fourth Of July—that was always at the McDaniels house. Run used to come over to my house after school. My mother and my father always worked when I was little, but from Monday to Friday, me and my brother were treated to five- and six-course meals. One day, Run would come over, look in the pot, and it was fried clams with fish. And the next day, it was barbecued steak. And the next day it was roast beef, and the next day it was grilled pork chops. My mother put it on! My house was a restaurant. And I think the importance of food is a big part of the reason why that song was able to touch so many people—Asian people; Hispanic people; Italian people; Catholics and Buddhists and Muslims. People could relate to that video, because what do you do during holidays and celebratory times? You sit down with your family and share that special meal. So not only does that record touch black people in the hood. It touches Jewish people, German people. It touches people all over the world. They can relate to what those rhymes about Christmastime symbolize. Tomorrow: Celebrate Christmas with a motley cartoon crew.